Met Nikita does not answer Kalmoukos’ question in any convincing way (and subjugating conscience to Patriarchal dictate raises its own set of questions). Yet, we need a clear answer from every Metropolitan affiliated with Constantinople since Constantinople is working behind the scenes to draw the American Church under its authority (that was the reason Constantinople did not want the OCA invited to the Episcopal Assembly). We need to determine that if the American Church does indeed move into the Constantinopolitan orbit, can it really be American? Can it really be free? BOSTON — Metropolitan Nikitas of Dardanellia, the Director of the Patriarch Athenagoras Orthodox Institute in Berkley, Calif. traveled to Istanbul to receive his Turkish citizenship. Metropolitan Nikitas (Lulias) is the first – and for the moment only – Orthodox bishop in the United States to have put in an application for Turkish citizenship. Speaking to The National Herald for Istanbul, Metropolitan Nikitas justified his decision to go ahead with process as follows. “If it’s about strengthening the Patriarchate, I’ll do anything.” He qualified his statement by adding “I left behind my home and my parents and went to serve our Patriarchate and Orthodoxy in Asia for ten years.” Metropolitan Nikitas was the inaugural Metropolitan of Hong Kong, before leaving his post in early 2007. Metropolitan Nikitas’ decision comes after a request made by Ecumenical Patriarch Bartholomew, following the current Turkish government’s assent to his request to grant Turkish citizenship to canonical bishops of the Ecumenical Patriarchate living outside of Turkey. This includes bishops living in patriarchal jurisdictions in Greece like Crete and the Dodecanese, as well as bishops from Europe, the Americas, Australia, and Asia. TNH has learned that none of the hierarchs from the Greek Orthodox Archdiocese of America – including Archbishop Demetrios – have applied for Turkish citizenship, for now at least. The reason for this delay is largely due to the fact that they fear that the matter will be publicized and that the Greek American Community will react harshly to this move. TNH first reported on this issue back in November 2009, during Ecumenical Patriarch Bartholomew’s visit to the United States. Essentially, any bishops of the Ecumenical Patriarchate who desire Turkish citizenship may apply for it to ensure their full participation in the administrative affairs of the Patriarchate – including the right to be candidates for the position of Ecumenical Patriarch and to vote in this election. This development was announced by Patriarch Bartholomew himself, during a dinner with Archbishop Demetrios and the other bishops of the Archdiocese on Sunday Nov. 1, 2009 at the Carlyle Hotel in New York. During his visit to the U.S., Patriarch Bartholomew brought along the paperwork for the Archdiocese’s bishops to fill out, which he gave to Archbishop Demetrios to pass along to the other Metropolitans. In addition to Metropolitan Nikitas, TNH has learned that the following hieararchs were called by Turkish authorities to sign paperwork for the processing of their applications. From the Church of Crete: Metropolitan Eugenios of Ieraptyna, Metropolitan Nektarios of Petra, Metropolitan Andreas of Arkalochorion, and Metropolitan Amphilochios of Kissamos. From the Dodecanese: Metropolitan Ambrosios of Karpathos and Metropolitan Chrysostomos of Symi. From Western Europe: Metropolitan Gennadios of Italy, and Metropolitan Michael of Austria (who is also an Austrian citizen). From South America: Metropolitan Tarasios of Buenos Aires, a U.S. citizen. From Asia; Metropolitan Sotirios of Pisidia, formerly of Korea. 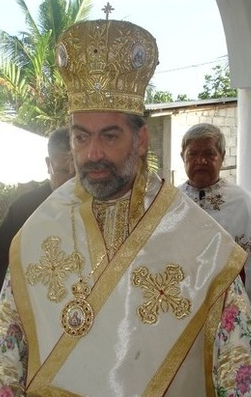 From Oceania: Metropolitan Amphilochios of New Zealand. TNH’s sources say that approximately forty bishops have sent in their applications. The previous fifteen were the first to be called. I only have one comment for the shameless action of His Eminence. George, I prefer the words of Tolkien in this case…. A strong place and wonderful was Isengard, and long had it been beautiful; and there great lords had dwelt, the wardens of Gondor upon the west, and wise men that watched the stars. But Saruman had slowly it to his shifting purposes, and made it better, as he thought, being deceived – for all those arts and subtle devices for which he forsook his former wisdom, and which he fondly imagined were his own, came but from Mordor; so that what he made was naught, only a little copy, a child’s model or a slave’s flattery, of that vast fortress, armoury prison, furnace of great power, Barad-dur, The Dark Tower, which suffered no rival, and laughed at flattery, biding it’s time, secure in its pride and it’s immeasurable strength (“The Two Towers”). Participating in the literary quotes, I submit C. S. Lewis for this topic. Any bishop who applies for, or is granted citizenship in another country should have their American citizenship revoked and they should be deported. If we are ever to have an American Orthodox Church these people need to go! I’m not so sure this is true. Citizenship in another country is not a problem in and of itself. Rather, the question it raises for the American Church is whether Turkish citizenship will compel the Bishops to represent Turkish interests in their administration of an American Church. We already see the interference of the Greek State in the internal affairs of the of the GOA (see: Matsoukas, “Don’t Call Us…We’ll Call You” – The Pentecost of Evangelical Orthodox Christians at the Phanar), so what guarantees do we have that Turkey won’t interfere in Church affairs as well? Of course Greek state interference is internal to the GOA, but if the American Church falls into the Constantinopolitan orbit, the question becomes relevant for all American Orthodox. Fr Hans, I’m with Fr Peter on this one. Ideas of “dual citizenship” smacks to me of divided loyalties. Even though the idea of a GOA bishop being both a citizen of the US and Greece might not be as scandalous as being a dual Turkish/American citizen, it’s only a matter of degree, not quality. And even though we Greek-Americans feel a kinship for our ancestral land, and are in fact allies (NATO), this does not mean that conflicts of interests an’t arise. Indeed, they have arisen in the past, much to the detriment of the GOA. Again, it’s a judgment call as to whether Greek state meddling in GOA affairs is less deleterious than Turkish meddling but it’s still foreign governments who are meddling, each with their own agendas and with varying degrees of hostility. I see potential for a conflict of interests in this situation. I agree with Fr. Peter. It’s worth noting (as he himself noted) that Metr. Nikitas is not a bishop overseeing any parishes in the U.S. He functions here directly under the EP to head the PAOI in Berkley. He did, however, attend and participate in the Episcopal Assembly, since the qualification for participation in it was being a canonical, active bishop serving in the region. Fr Andrew, this type of equivocation is unbecoming of any bishop and in fact goes to the many arguments we have been raising on this blog since almost before time began. 1. What “flocks” in Turkey exist that then need a bishop of their own citizenship. If the EP is the Arcbhishop of Istanbul, that makes sense, but he’s not just that. 3. Just how are the EP “elected”? And since we’re on this subject, the patriarchs of Alexandria and Jerusalem? How are they chosen? 4. As to why should +Nikita had been allowed to sit on the EA I realize the qualifications are twofold. He had one of the qualifications (being here) but as for “serving” what exactly is he doing at the PAOI? Can one be a “metropolitan” of an institute? 5. Shouldn’t the people of the various regions covered by the EAs expect that their bishops be native to them, or at least citizens of their respective nations? People around the globe know of many more things that Turkish government wouldn’t allow, and what the Turkish government can do to uproot the dissent … in any area of life. This is in the subject of potential conflict of interests. The Codes of Ethics in any field caution against entering into relationships involving conflict of interest. It sure is nice that after soooo many years as a “mission” to Turkey that a “nice Turkish boy” became Patriarch. No, this is not nice. Forgive me, I understand the irony, Chris, but we cannot joke on the subject. It is a serious matter. I actually agree that what Fr. Peter says “Maybe it is time to move on out of Istanbul to another place would actually allow the EP to function”, is the answer here. Frankly, I think those who disagree with the actions of M Nikitas are naive about the future of the Mother Church of Constantinople. Having bishops apply for Turkish citizenship is one way to continue 1,700 year old history of the Ecumenical Patriarchate. Remember, we are called to serve the Church – that is, Christ – not a specific community or country. We should have the humility to appreciate the sacrifice of M Nikitas, instead of thinking only of our parochial interests. Evangelos, since you feel this way, would it be ok if a non-Greek-American applied for Turkish citizenship, or say, a Russian national? Maybe it is time to move on out of Istanbul to another place would actually allow the EP to function. Isn’t change of citizenship an act of betrayal as it is? It is. And the clerics, especially, should be able to see it’s nature as such. Antioch was lost. Just as Ciliccia has been lost to Armenians. It would be supreme folly to give up the great Ecumenical Patriarcate, seat of several Ecumenical Councils, where the foundation of ALL of Christianity was forged. There are no more than, what, 1,200 Greeks in Turkey? There are over 20,000 Russians in Turkey (and growing). What they are really afraid of is a Russian EP. I’m also deeply disappointed that the EP still sees himself as the ethnarch, and indeed, the entire Greek Orthodox community of hierarchs do as well. Don’t they realize that this is a designation foisted upon them by the Turkish Muslims who revile and hate them? Neither should any of us today. Without singling out the GOA, which is not the only culprit here, I think it’s important for Americans to recognize that, aside from violating Orthodox ecclesiology, NO FOREIGN based system of governance is EVER going to work for united Church in America. Which is why the Church Fathers set up a system of local churches to begin with…they anticipated the problems inherent in a distantly ruled church. The GOA has certainly had it’s problems with foreign dominance (the charter, Abp Spyridon etc), but so has ROCOR, the Metropolia, the Romanian Episcopate (now in the OCA) just to mention a few. The most recent example, and the one that anyone paying attention should sit up and take notice of, was the Antiochian Archdiocese, which only recently lurched from some sort of Self Governed status back to one in which the bishops are not bishops (still TBD). This is no different, in degree or direction, than the GOA – which those of us familiar with the charter issues know was originally setup as an autonomous church, in the 1920’s…and has moved in a retrograde motion to become an eparchy of the EP. While some of us may be more critical of the GOA, because of our familiarity with the issues there, the problem is not the GOA or the EP. The problem is really in America. The Old World churches, all of them, will continue to meddle in, stifle, confuse, obfuscate and direct the American Church for just as long as we will allow them to. The minute we recognize “the emperor has no clothes”, the game is up. It’s for us, in America, to simply and calmly say, “ENOUGH”…we have had enough of the foreign meddling, enough of the parochial and self serving foreign interests, enough of a complete lack of care about future generations in this country, and enough of the self aggrandizing and ridiculous notion presented by the Old World churches that we in America are any less mature, any less aware, and any less Orthodox than those in the traditional Orthodox homelands. And we don’t need to have a foreign patriarch presiding over the American Church to imbue us with some sort of apostolic legitimacy or bona fides. I couldn’t have worded the root of the problem better than you did it here, Dean. That’s how hundreds of thousand people see it. The citizenship and nationality of a bishop would make no difference if he were serving Christ and not the world. If we have a Godly bishop, we should not care what worldly citizenship he carries. +Niktas really disappoints me however, he spoke at my home parish when he was on his way to Hong Kong to be installed. He seemed like a genuine guy but with his treatment of Fr. Daniel Byontoro and now this, one has to wonder where his priorities really are. If we are going to rid ourselves of all of he accretions of dhimmitude, a lot of the bishops vestments and quite a few other things would have to go as well. We do need to rid ourselves of any sense of the concept of synergy between the Church and the state. Not healthy at all in these times, if it ever was. Render unto Caesar and all that, but there are too many anti-Christian realities in all governments to allow for any coziness or attempts at coziness. Just a question, what would Turkey do if a non-Turkish citizen was elected to the Patriarcal Thone? Seize the Phanar, force the Patriarch into exile, imprison him, marytr him? Wouldn’t all of these be preferable to kow-towing to an Islamist state? Wouldn’t all of them actually increase the authority of the EP in both the Orthodox and non-Orthodox world? I’ve always thought of Greeks as, by and large, fighters not appeasers. Am I wrong? Michael, excellent point. The issue of Fr Daniel needs to be brought up. What a travesty. Re: Wouldn’t all of them actually increase the authority of the EP in both the Orthodox and non-Orthodox world? I’ve always thought of Greeks as, by and large, fighters not appeasers. Am I wrong? Yes, there have been Patriarchs killed by the Turks, but generally because they had failed (from the point of view of the Turks) in their job as Ethnarch, i.e. leader of the Rum Millet [i.e. Roman nation] (such as following the Greek Revolution – which they publicly opposed). From perhaps a more impartial, historical point of view, it is apparent that the Turks unleashed “a demon” within the patriarchate, seducing it with secular powers which were unheard of before the Fall; courts, schools, legal powers; This was all done in a conscious attempt to subvert and co opt the ecumenical patriarchate. Bear in mind that following the conquest of the Balkans and most of the Middle East, the Turks, still at war with the Western Christians, it found itself ruling with a huge and potentially dangerous Orthodox Christian population – possibly 40% of the Empire. In an effort to prevent that population from becoming a “fifth column” allied with the West, it took the very logical action of working with the Christian administration (led by the EP) which remained, elevating it to the position of secular “rulers” over that minority, and turning over significant secular power in the process. While I suppose it is arguable, I’d argue that the Ottomans succeeded in neutralizing the EP beyond their wildest dreams. In any case, it was a very deft, and effective political move. As I’ve read the comments above, I honestly have no problem with foreign bishops….I’ve known some great ones – and some miserable American born ones. On the other hand, i have a major problem with bishops acting as foreign agents, or agents of foreign governments, which is what many of the primates of American based jurisdictions have devolved into. It’s no secret that the GO Archbishop of America is the unofficial Greek ambassador in America. To be honest, this whole debate serves to remind me the critical importance of defining self governance as “locally elected bishops, sitting in synod”. This whole idea of bishops being selected overseas, by whatever process, is not an academic debate. I think it undermines the legitimacy of the bishop (in his own diocese), and raises unneeded questions about the loyalty and agenda of that bishop. At the end of the day, you’re either part of the American Church, working 150% of the time for and on behalf of your diocese, right here in America – or you are promoting a foreign agenda. Perhaps the bigger question, the one that certainly occurred to me anyway, is this: Why are bishops appointed by foreign primates, and with no Sees in America, even PARTICIPATING in the American Episcopal Assembly? Put differently: Let’s see, this bishop, with no diocese or parishioners at all, participated in the EA with the same voting rights, ability to participate etc. as Metropolitan Jonah, a man with 1000 priests and parishes, 3 seminaries and who knows how many monasteries? Dean, as usual, no one says it better than you! If we are ever to have an American Orthodox Church these people need to go! I think it’s close to time we all wake up! Having a so-called “American Orthodox Church” is a pipe dream and I have been smoking from this pipe long enough! Let’s face reality: becoming part of the Constantinopolitan orbit is all but assured. I am sure we have all spoken with hierarchs who were at the recent Episcopal Assembly. My contact said to me very cleary that he is convinced a swap between Constantinople and Moscow has already been agreed upon. Eastern Europe, Ukraine, the Middle East (Moscow) for North, South and Latin America. The part I don’t get is: my Patriarch (Ignatius IV) through His representative agreed on the IV Chambesy protocol, without any consultation with North America. So I feel betrayed twice over. But at least I am now longer smoking from the “American Orthodox Church” pipe any longer. “The truth will set you free”. I’m trying to imagine how there is any remote possibility of this being the case with the OCA having received a tome of autocephaly from Moscow and with the Russian Church reaffirming its support of this autocephaly recently in the tiff between Fr. Elpidophoros and Met. Jonah. Also, I’m pretty sure it will be a cold day in hell when ROCOR comes under the omophorion of Constantinople. Now, what Antioch chooses to do is anyones guess. I don’t think this rumor – – which I’ve heard in various forms for a couple of years now – – has any basis in reality at all. Probably wishful thinking on the part of those who would like it to be so, or psych-warfare. However, I agree with you on the subject of whether there will be a united American Orthodox Church. Nothing whatsoever at the EA demonstrates anything more than status quo ante. In effect, SCOBA’s name was changed to “the Episcopal Assembly”. Not sure status quo ante: for one, Met. Jonah hasn’t been put on the executive committee. Yet. She might do well to ask the Phanar. Met. Jonah and his Holy Synod are now on that list of canonical bishops, and are not listed under Moscow. The Phanar’s going to have to explain that, and soon. We won’t be waiting. Angelika the other Istanbullers will have to keep on doing mental gymnastics to figure out to themselves who things regarding the OCA didn’t work out to their phanariot advantage. Stuff like that gives sophistry a bad name. Kevin, you might be right about the deal between Moscow and the EP. However, Americans will never tolerate the Phanar’s Shenangians and their appeasement of evil. Coddling Castro, turning a blind eye when Christians are killed in Turkey, and preaching omogenia (race) before Orthodoxy will not be tolerated. The Byzantine political playbook does work in the USA. Let the Constantinopolitan Orbit come, let the Phanar send of Spyridon 2.0 to replace +Demetrios. Let the omogenia rhetoric be unleashed. I bet under such pressure an American Church will unite and be born under the auspices of a genuine revolution of Orthodox Christian conscience. Tell me are the any EP Bishops left in the world who will speak up when a Catholic bishop is killed in Turkey. Are there any bishops of the EP who will speak the truth to Turkish power when then send a flotilla of Hamas cronies to Israel? Sorry, but Metropolitan Nikitas and his brothers who are running to the Turks to obtain citizenship are not heroes or supporters of the Church. They are appeasers who put convenience before Conscience. They are the Orthodox equivalent of Neville Chamberlain. Where is the courage to stand up and just say NO. The difference between SCOBA and the EA is that this assembly has canonical “teeth” and the support of the Exarchs. SCOBA did not. And the teeth are in the mouth of the Phanar, through Archbishop Demetrios. What impact will itty-bitty ROCOR have on the global politics being waged between Moscow and the Phanar? His Beatitude Jonah (OCA) sat at the end of the table isolated, past the last, lone bishop. He was barely present. The likely outcome of all this will ironically be that of St Tikhon: an omophorion under Constantinople and various “old world” – appointed bishops in charge of various “ethnic” groups. Forget an “American” Orthodox Church. We are a bit player on a global stage, run by actors reading from a different script. Kevin, as someone who doesn’t trust Old Worlders as far as he can throw them, I think you’re looking at this much too darkly. Whether a united American autocephalous church comes out of this is anybody’s guess. My guess is probably not. But that’s not necessarily a bad thing. As to the shabby treatment of +Jonah, I have been stalwart in criticizing those who treated him thusly. Having said that, he gets the last laugh, laughs best. I think that +Demetrios was a hero in this regard and the ground has shifted because of his actions against C-pole. Remember, the OCA and +Jonah weren’t even to be invited. The genius (idiocy?) of Chambesy is that none of the present jurisdictions will lose their integrity. Therefore there can be no hostile takeovers. That’s good. My prediction? More my hope actually: that +Jonah and +Philip merge ASAP and fine tune the diocesan boundaries that already exist. There are two poles at work here: whether Orthodoxy is a missionary endeavor, or whether it is a colonial one. My guess is that if Orthodoxy is to succeed in America, the former position will prevail. The difference between SCOBA and the EA is that this assembly has canonical “teeth” and the support of the Exarchs. SCOBA did not. And the teeth are in the mouth of the Phanar, through Archbishop Demetrios. LOL. Those aren’t teeth, they’re dentures, and Archb. Demetrios has unfortunately misplaced the Phanar’s fixodent. Let the Bash Millet-i take a bite: he should have learned with Spyridon that some people bite back. All the exarchs, and the local primate, were at Ligonier, and with two exceptions, all supported it. Indeed, it seems some still support it. I see nothing that indicate that Pat. Kyrill is ready to give the knife to EP Bartholomew to cut Russia’s throat with: remember, with the dissolution of the Soviet Union almost, if not more, of the Russia Church now is in “Diaspora.” Witness the reaction over Estonia. It still seems the Phanar is being strung along to get enough rope to hang himself. All this talk about Met. Jonah being at the end of the table: in the OCA’s own diptychs, he comes at the tail end. And he sat there with all of his Holy Synod. And in the group shot, he stands near the exact center, among the reast of the primates (Met. Methodius I do note, inserted himself in, but then in many ways he thinks himself a primate anyways). This, when the EP, at Moscow’s invitation, was forced to hear His Beatitude’s name in the diptychs, and concelebrate with His Beatitude’s representative. No the EA has no teeth at all. In fact, it has no real power in and of itself – – just to make suggestions to the primates at the always to be coming, just right around the corner, Great Synod. Of course, SCOBA had no teeth either. They are nearly identical except for two things: 1. the EA was endorsed by the primates and 2. the EA has a slightly longer list of bishops. Those differences are immaterial since they in no way affect the capabilities of the EA as opposed to the SCOBA. It is nothing more than another toothless tiger useful only for doing coordinated mission and charity work. As to “the deal”, if the OCA will not join this new local autonomous church under Constantinople and neither will ROCOR, then I’m afraid I don’t see what the MP gave up (assuming there was a “deal”, which I don’t believe there was). The MP has no power to tell Antioch to let the AOCNA join GOARCH or not to join GOARCH. Why would Moscow need to be involved in such a deal at all? It would have given up absolutely nothing. It’s agreement was not even necessary. Constantinople would gain absolutely nothing from such a deal. Why would the Phanar give up claims in the East for – – nothing? Why would Constantinople seek the agreement of Moscow for the AOCNA to join GOARCH if the MP has no say in the matter in any case? That’s why I think the whole “deal” talk is a kind of propaganda meme aimed at discrediting Moscow. When you actually look at the terms of any such deal, it immediately appears that no one would be interested in such a pact. It depends what they do with it. Already, the Phanar has been cornered as to what to do with OCA. Getting the bishops all together into a critical mass to stop thinking as ethnarchs for whatever Matriarch and start thinking and acting as a local synod may seem minimal, like a mustard seed. I’m in the process of looking at the charters of all the jurisdictions here. Under the canons, they have the authority. As I said, keep the ball rolling whither Met. Philip lobbed it, Ligonier. I would agree with you that the Old World Churches have cut a deal, and that deal is Ukraine and W Europe (to MP) for American (to EP). S. America apparently goes to Antioch. We’ve all heard it for months. And I would agree with you that the EP and Phanariots might think that they pulled a fast one, beginning their attempted “coup” in America with this Assembly. 1.) When was the last time a group of assembled leaders (not just church, any group) willingly GAVE power to someone else – this runs against human nature if you ask me. 2.) How is the AOCA, which is at least 50% converts, and with their evangelistic outlook EVER going to coexist in the same house with the GOA? I have confidence that the EA was convened with the most selfish and parochial of motives on the part of the EP. But I continue to believe that the Holy Spirit has a surprise in store for the Phanariots….once convened…these bishops just might begin to act like bishops! Also, I think it would be a HUGE miscalculation to assume that because Met. Jonah showed humility, and attended as a bishop (instead of a church) that he, or the OCA, is going to submit to a EP dominated church. He has announced his terms for setting aside the OCA’s autocephaly – and I for one didn’t hear one word about “foreign patriarchs” being involved. Finally, as far as being a “two bit player” on the world stage. Big deal…so we’re not a 2000 year old patriarchate with lots of buildings and no people. Is that something to aspire to? On the “deal,” take a look at BarbD. “Voices from Russia” (the irony of it coming from Albany seems to be lost on her). I have no illusions about Bart, but what’s his game? We know he’s got the US behind him. He’s cunning. Moscow must be even cleverer in order to outwit him and his plans for a wooden nickel Council. According to the Athens newspaper To Vima of 8 July 2004, Ecumenical Patriarch Bartholomew responded to the “Third Rome” theory of the Patriarch of Moscow (which had been brought up for discussion during the Eighth International Assemblage of the Russian Orthodox Church) by calling it “…foolish, hubristic, and blasphemous”, because “…it resounds with the spirit of caesarpapism and vaticanism; something totally unacceptable to the Orthodox Church”. “The foolish theory pertaining to a ‘Third Rome’ is hubristic (in accordance with the ancient Greek definition of this word [having to do with overweening arrogance]), and blasphemous. New Rome may be the first among equal Patriarchates, but she has never sought to dominate and exercise power over the other Orthodox Churches. We recognise her primacy in the stewardship of our unity, and she has performed this function humbly and absent any exercise of power”. Our criteria of ecclesial identity and unity are not the measures of this world… of numbers and wealth… but derive instead from the Holy Spirit, as this is revealed in the Church Councils and the Holy Eucharist. This, I believe, trumps all of his airy-fairy talk in Russia. The above quote reveals that Bart shall never give an inch on the question on who is primus inter pares. In itself, such would torpedo any actual calling of a “Pan-Orthodox Council”. In short, all the talk of “accelerating” the calling of such a Council is mere verbiage, notional wind, and anyone who believes it is a thrice-damned fool. Bart is in dire need of money… and he needs help desperately to reopen Halki. Therefore, he capitulated to the Russians on many peripheral issues, and he talks much of “unity”. I have not forgotten any of his nasty statements of the past twenty years (he became head of the EP in 1991)… neither has anyone in the leadership in the MP. Trust me… there is no love lost on either side. Isa, tell your friend that if they think that the EP has “the US behind him,” she’s quite mistaken. The US couldn’t get the Turks to reopen Halki. And let’s not forget the EP’s 10 minute visit to Obama at his hotel room in Istanbul. “…even a cursory study of history shows us that every heresy, schism and ecclesiastical division stemmed from personal ambition and egotism, only later to be robed in the mantle of dogmatic diversity”. “When we emphasize our vastness and point to statistical demonstrations, it means that we are not shepherds, but rather operatives of power, exploiting the administrative and spiritual authority that springs forth from our position”. “The pentarchy is comprised of Old Rome, New Rome (Constantinople) and the Patriarchates of Alexandria, Antioch, and Jerusalem. Not only was Moscow never considered a member of the pentarchy, but also there are no ecclesiastical or canonical texts that designate Moscow as the replacement or substitute for Old Rome”. “It is clear from the discussion that the Ecumenical Patriarchate will certainly not lose the position of primacy that it maintains; the ranking of the Orthodox Churches will not change; and the committee in question–or any other committee that is formed–will not institute rebellious changes in the Orthodox Church”. Indeed: I’ve seen many a Vatican polemic which would say the above, just replacing Moscow with Constantinople, on New Rome’s upstart status. As long as the likes of Angelika and BarbD feed the baser side of their patriarchates abroad, us who pay attention to the lands where we live need not fear any deal coming soon. LOL. No love lost on any side. As much as my opinion is worthy (not much),I’m not too certain that I would accept an American Orthodox Church under the EP+ or any foreign patriarch. On a related note. I made a conscious choice to step away from the Macedonian Orthodox Church with all of the “bad choices” that were made or are being made within and around that community. Yet, no one will ever convince me that the same sort of hegemonistic acts that are now attempting to undercut the OCA weren’t undertaken against the MOC. I mean, it is hard to understand that a stipulation to enter back into communion would be to change the name of your church and not be overwhelmed by the sharp stench of nationalism. I know from experience. The political posturing that is occurring right before our eyes, the sort of posturing that I once thought safely boxed away in our Church’s history, is how schism are started. But at some point, you have to ask yourself, who is the schismatic? The hegemon who has lost all concept of true Church obedience, or the one who separates from the former out of self-preservation? Re: But at some point, you have to ask yourself, who is the schismatic? The hegemon who has lost all concept of true Church obedience, or the one who separates from the former out of self-preservation? I honestly think this was one of the most incredible statements ever issued from an Orthodox Council..particularly when you consider the date – 1872…America had just concluded a Civil War…and these bishops were stating something so unequivocal that it might have come out of Martin Luther King’s mouth…100 years later. Put differently: The church is territorial, NOT ethnic! After highlighting a quote of that caliber there really is nothing to add or argue with: ethnicity is irrelevant & the Church is a local territorial phenomenon PERIOD. However, the faction within the Church that propagates ethnic distinctions & fantastic interpertations of Chalcedon’s 28th canon does not operate within the oppressive confines of logic or historical facts. They are quite literally unreasonable, often even refusing to respond to arguments that expose their anti-intellectual tactics. I’m afraid that you are preaching to the chior here on this blog. You have to spend your time & money in order to meet them where they are at. For instance, I will be traveling the St. Vladimir’s Seminary this coming weekend to hear Archimandrite Elpidophoros speak. I hope & pray that the “moderators” will be fair enough to allow members of the audience the chance to speak out against heresy & non-facts in the open forum at the end of his talk. We will see. I wish I was going with you!!! I think you will find the St Vlad’s crew more than willing to allow you to challenge the speakers…Hellenism has few fans up there. Personally, I was honestly considering broadcasting this program in another webinar. I think people need to hear the nonsense that comes out of their mouths. When it’s repeated later, it sounds so preposterous as to seem unbelieveable. I’m a big fan of giving people like Arch. Elpi-knucklehead the biggest megaphone we can find. It’s time people in this country understood the full extent of the intellectual bankruptcy that exists in Phanar. Go and make us proud!!! And take no prisoners!!! Dean, it must be recorded! and it’s not “Hellenism” that Hopebearer is preaching, it’s “Balkanism,” “ghettoism,” or “Greekism,” not Hellenism. In any case, Christ is in our midst! Kevin, Dean, Isa, et al: Many of us are assuming that a “deal” has been worked out. North America/EP, South America/Antioch, Europe/Russia. Why do we make this rush to judgment? Isn’t it possible that no deal at all was struck by Moscow and Istanbul? Let me explain. The way I see it, it appears to me that Moscow dictated terms to the Phanar. Consider all the little slights that the EP has had to endure recently: the seating of +Jonah, the inclusion of the OCA as NOT being part of Russia, the forced concelebration with an OCA priest in Moscow, the hearing of +Jonah’s name in the dyptichs while at the same liturgy, the fact that he was called “your holiness” and the “patriarch of Constantinople,” etc. The phanariote-groupies also seem to be overlooking the biggest fact of all: for all its deficiencies, the Episcopal Assemblies have codified a new reality, that is that in the regions of the “diaspora” NO ONE patriarchate has jurisdition, instead ALL of them do. Sorry for the caps but this is has become blingingly obvious to me at least. Don’t forget, that in the language of Chambesy, presidency goes according to the Dyptichs, which is purely a statutory claim, not a theological one. c. the botched removal of +Demetrios as archbishop (orphangate). 9. It is trying to increase its presence in America with monthly fireside chats with Fr Lambrianides. Also, let’s not forget what Turkey is bringing to the table: war-mongering with Israel, destabilizaton of American interests, and ever closer ties to Iran, a truly fascist state. Anybody want to guess who Turkophilia is going to play to American inquirers? What’s going to happen when –not if–the American government finally decides to recognize the Armenian Holocaust? Where are the brave Phanariote voices raised in righteous indignation? And let’s not forget the wonderful Riverboat tour all in honor of global warming. Even MSNBC didn’t carry it. The question I have to ask is why did +Demetrios consistently defy the EP? Regardless of the treatment of +Jonah, the OCA is the Trojan Horse that has been let into the EA. I’d like to think he was doing the Lord’s work. It’s also possible that he was working in tandem with +Kirill. The only thing I can say for sure is that there are two poles apparent in North America: the missionary/evangelistic pole which is centered around the OCA, and the colonialist outpost pole, which is centered in the Phanar. As of now, it doesn’t seem that the Phanar’s long-term viability as an institution is all that solid. Besides the OCA and its autocephaly, which has now become magnified tremendously thanks to the ineptness and hubris of the Phanar, the only other wild card that could trump all this would be the EP pullling up stakes and moving to Washington and becoming Patriarch of the Western Hemisphere. This is what +Philip says he wants. Speaking for myself, I rather doubt that anybody else is serious about this. My guess is that +Philip is telegraphing a rather loud message to +Kirill to restrict the EP even more than he already has. If any EP moved to Washington, it would signal that America is the “fourth Rome” and that is not what Moscow wants to hear. Unlike Ligonier (whose spirit is arising), EP Bartholomew can’t complain about NYC ’10: it was his own process. The OCA’s bishops sat as a synod, separate and apart from Moscow (whereas ROCOR and the MP sat together), and are listed as canonical bishops. Well, canonical bishops belong to a synod, and the OCA isn’t in Russia’s. Archimandrite Hopebearer is without hope on explaining the OCA now officially bonafied canonical status. The diptychs may be a purely statutory claim, but we all know how the Phanar lives to make it theological. I’m waiting to see what happens in Australia, where the exarch is refusing to call an EA, and Great Britain, where they haven’t called one yet; what happens if the EP’s representative refuses to do what the Chambesy accords, signed by “unanimous agreement by ALL the Churches” (as Fr. Arey likes to claim), mandates he do? It would be nice if Chambesy buried the 28 claims, but Arch. Hopebearer has already argued that it is “economia,” the mercy of our “Mother Church” that she doesn’t insist on her rights. But Chambesy does give the rest of us the tools to bury the “28” mythology. Right now the focus should be on Met. Jonah getting his seat on the executive committee, and opposition to the dissolution and transference to the EA of SCOBA until he does. Isa, interesting points. Like you, I’ve wondered if we have perhaps seen the last EA assemble anywhere in the world. Clearly the first EA in South America proved to be a debacle on its own merits. The second one here in NYC however was fiasco as far as the Phanar is concerned (as you ably point out), but a success from the OCA’s –and more importantly, America’s–standpoint. If what you say is true, that the ones for Oceania and UK haven’t been called, then I see no way for the other ones (Benelux, Scandinavia, etc.) to be called. I just don’t believe that outside the good ole USofA any of the bishops there have any stomach for evangelism and canonical order. Of course this will put paid to the braggadocious claims of Fr Arey that these EAs are “mandated” by the Chambesy signatories to meet. Yeah, so? The interesting thing is how is Moscow going to take the apathy? That’s going to be the interesting thing to watch. Once it becomes more clear that the Phanar has again not acted in good faith, then I wouldn’t be surprised if it doesn’t take matters into its own hands. Don’t forget, Medvedev and Putin have Erdogan on speed-dial. No, others have been called. The one in France infamously (from what I’ve heard, Spyridon would be at home there), Italy, Switzerland and some others. Australia and GB, are going to stick out. And you are right, once the propaganda hits the fan, what then? There EAs were supposed mandated by the alleged unanimous consent of all the Churches and placed in the self-proclaimed Ecumenical hands, and his minions drop the ball. Tsk! Tsk! Not going to look good. I think, however, we should keep ours (and for the time being, Canada as well: Met. Sotirios was evidently the only Canadian bishop missing, and I doubt for reasons deserving praise). Just keep the ball rolling from where Met. Philip lobbed it, Ligonier. Alexander. Had to delete your comment. I don’t allow unsubstantiated allegations, or disrespectful language toward others on this blog. I would agree that one appears unlikely to be called in Australia in the near future. The Australian version, ‘SCCOCA’, exists in a very different form to when it was begun: there were five jurisdictions (Antiochian, Greek, Romanian, ROCOR, Serbian), and after a number of events occured, two withdrew (Antiochian and Russian). In current times, concelebration between Greek and Russian clergy is not allowed, and between Greek and Antiochian clergy is, at most, uncommon (and expressly forbidden in Sydney). Added to that the small size of the Romanian jurisdiction (only recently getting a bishop for ~5 Australian parishes) and, really, SCCOCA has two jurisdictions, with bishops who concelebrate on Bright Friday each year, and that’s about it. Added to that some long-standing disputes between the Greek Archbishop of Australia and the Ecumenical Patriarch…well, no, I don’t think anyone could anticipate an EA happening in Oceania any time soon. Isa, you’re right about the “mercy” and “economia” part, but don’t forget, Lambrianides made that speech before Chambesy when it was still the official policy and he was pushing the envelope. Although Chambesy was not without its problems (no bishops from the “diaspora” there), it was a carefully crafted document and it represents the official word now. It’s the “next level” and Canon 28 and Constantinopolitan supremacy were nowhere to be found. Now, I’m fully aware that the Phanar still believes it but because of Chambesy, they are now trapped in a new reality, ironically of their own choosing. It’s important not to conflate the views imposed from afar on local GOA parish leadership as prevaling and held by those who attend the parishes. Yes there are those who can be motivated to stand up and say whatever it is those who need such persons to say for them. Not even the Captial ‘G’ Greeks here can stomach the idea of property here being turned over to Turkey even under color of the Phanar. They didn’t leave Greece to become dhimmitude recipients half a world away. One helpful activity would be to create what we think a proper vision statement for the EP ought to be. So far it’s pretty clear what we think it ought not do. If the EP would wake up tomorrow and start doing ‘everything right’ — what would that be? In order to understand who has the real power in the Orthodox Church one needs to reduce the magnifying power of the analysis. We keep zooming out such that we have the 2000 years history of the Church on two pages. Persecutions, heresies, and the Great Schism fill one page. The after-schism to present fill the other. At the end of the first page it seemed that the enemy won. About the same time Russia becomes orthodox and the fight goes on. Next are the barbarian invasions and the Ottoman Empire. The communism seemed to be the end of the Orthodox Church. The Christians were slaughtered in the Orthodox communist occupied countries. The others were rushing to embrace Rome (EP among the first) but were shouted down as heretics. The Communism fell, the Orthodox church arose from the ruins and is flourishing, watered by the blood of the martyrs. It has spread to other non-Orthodox countries, including US. The question is not if the EP or EA has real power. Christ has the power! The Orthodox Faith is not, first of all, of the head. First of all, it is of the heart: it is felt and believed by the heart. Through the Lives of the Saints, we develop an Orthodox heart. To the people that are saying that the EP will be taking over all the churches in North America; does any of you know when such an act could take place? Andrew, the EP does not have the authority to “take over” the American Churches. His authority extends only to the GOA. Fr. Mark Arey, who speaks for the EP implies that an administrative ordering will be imposed on the American Churches by fiat through the Mother Churches, but this may be no more than bluster as this stage and merely affirms the EP’s desire to bring all the American jurisdictions under his aegis. We know this because the Canon 28 apologetic developed to rationalize the EP claims fell flat at the Chambesy Conference. This is not to say that Constantinople no longer believes they have authority over the American Church (they still believe it), but only that no one else takes it seriously. Constantinople is trying to drive the Episcopal Assembly process in their favor. Whether or not the American jurisdictions will follow it to the end is far from settled. Fr if I may, the autocephaly of the OCA (which is now accepted by the other jurisdictions, albeit reluctantly and not trumpeted) means that its Holy Synod is free of foreign interference. I wonder how this will play into the calculations of the Phanariotes who as you rightly state, still want all of America under their control. My guess is that their claims will become taken less seriously as time goes on. how low can the GOA go?this is a sick mentality that should be stopped asap. The situation, I think, is that we are Orthodox Christians. Now, what does that mean? live and teach the ancient and unchanged Content of the Faith, and then to evangelize it to the ends of the earth, to draw people into a sound, serious and saving relationship with Jesus Christ. resembles in no way the primacy of the Vatican, and (as we saw in the aftermath of the “Great and Holy Weekend in Crete”), nothing they do will make it so. Orthodoxy simply isn’t geared for papacy. had good, solid, impregnable-looking structures. chips slowly and subtly, until one day one wakes to find a big hole in the wall through which demons enter at will to freely roam the corridors. it, because we are already too busy fighting each other to be able to spare the time we should be sparing in order to fight evil. “right” and “wrong” are fetchingly appealing. wouldn’t every compromise, simply by nature, diminish the objective immutability with which we are to regard the Faith? agree on materials and practices that are properly common, without trying (or being able) to impose cookie-cutterism on anyone else. us strong despite our incessant squabbling. we will, I think, lose who we are.